Eco-Friendly Topcoats | Hawk Research Laboratories, LLC. 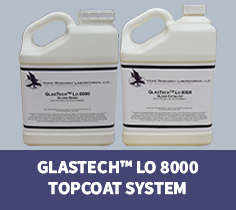 GlasTech Lo 8000 topcoat system is a high-solids, 2 component roll applied topcoat for use on a variety of surfaces. With its low VOC content (< 100 grams/liter), low odor, fast return-to-service time and exceptional impact and abrasion resistance, it is an excellent choice for indoor and commercial applications where units must be returned to full service the same day. GlasTech Lo 8000 Topcoats are available in gloss and semi-gloss finishes. 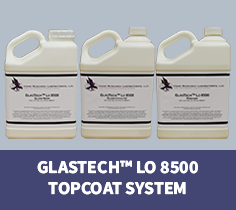 GlasTech Lo 8500 topcoat system is a high-solids, three component spray topcoat for use on a variety of surfaces. With its low VOC content (< 100 grams/liter), low odor, fast return-to-service time and exceptional impact and abrasion resistance, it is an excellent choice for indoor and commercial applications where units must be returned to full service the same day. GlasTech Lo 8500 Topcoats are available in gloss and semi-gloss finishes. 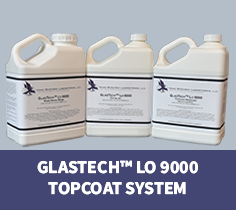 GlasTech 9000 topcoat system is a two component, high solids, high performance acrylic urethane system. This fully cross-linked aliphatic urethane is extremely durable and is the most proven, long-term refinishing topcoat available in the world today. As GlasTech 9000 topcoat is applied, a clear, resin-rich layer forms on top of the film. The 'deep, rich gloss' is a barrier layer that provides what other coatings lack: long-term protection against harsh impacts, chemicals and moisture. The GlasTech 9000 resin system is available in pure white, standard white, and all standard plumbing fixture and appliance manufacturer colors, including clear. Catalyze 2:1 with GlasTech Lo 9000 Catalyst and reduce as necessary with GlasTech Lo 9000 Fast, Medium, or Slow reducer. 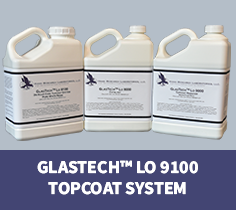 GlasTech Lo 9100 topcoat system offers the same dry film performance as the GlasTech Lo 9000 topcoat, yet offers a return-to-service time of 24 hours. Faster return-to-service is ideal for smaller homes with limited bath facilities or hotel and motel venues. Mix 2:1 with GlasTech Lo 9000 Catalyst and reduce as necessary with GlasTech Lo 9000 Fast, Medium or Slow Reducer. 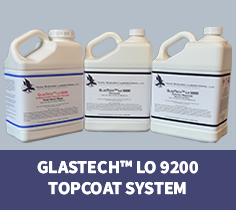 GlasTech Lo 9200 topcoat system offers the same dry film performance characteristics as GlasTech Lo 9000 and GlasTech Lo 9100 topcoats, yet has a return-to-service time of only 4 hours. This topcoat system utilizes a revolutionary technology that enables a fast cure, without the brittleness or softness that can sometimes occur with other lower quality technologies. Mix 2:1 with GlasTech Lo 9000 Catalyst and reduce as necessary with GlasTech Lo 9000 Fast, Medium or Slow Reducer. Note: 4 hour return-to-service time is under the following conditions: 4 hours at 75°F, 50% relative humidity with sufficient ventilation and air flow. However, resistance to heavy detergents, household cleaners and solvents will require several days of curing. GreenTech Low VOC 4-hour cure topcoat system is a two-component urethane system used for all kitchen, bath and architectural surfaces. 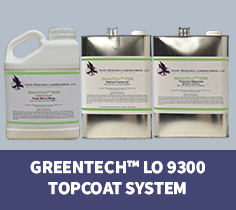 GreenTech 9300 topcoat incorporates the same outstanding dry film performance characteristics of the GlasTech™ 9000 family of topcoat systems, in a formula which is VOC compliant, even in tough compliance areas like California’s South Coast Air Quality Management District*. Mix ratio is 4:1:2 with GreenTech 9300 Catalyst and GreenTech 9300 Reducer. When mixed and reduced as specified, the VOC content of this topcoat system is less than 250 grams per liter. Further reduction to meet specific applications does not negatively affect the VOC compliance. In addition to full VOC compliance, GreenTech 9300 topcoat has unparalleled sprayability, gloss and impact resistance. Unlike epoxy coatings, GreenTech 9300 topcoat possesses all the UV resistance, chemical resistance and fast-cure properties of our 4-hour cure GlasTech 9200 topcoat. IsoFree Plus Lo topcoat is an isocyanate-free acrylic polymer coating system that is formulated to offer refinishers a safer coating system which also will endure high moisture laden environments for extended periods of time. 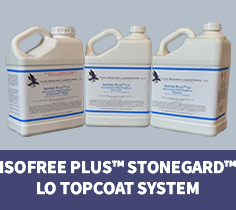 IsoFree Plus Lo topcoat delivers exceptional dry times, film hardness and chemical and stain resistance. IsoFree Plus Lo topcoat is ideal in applications where isocyanate exposure sensitivity may be an issue. StoneGard Lo topcoat is low odor, VOC compliant, clear, fortified urethane topcoat designed for use with multicolor finishes on countertops. The StoneGard Lo topcoat system has a VOC level less than 350 g/l and significantly reduced odor, while maintaining the same coverage and performance as the traditional system. StoneGard Lo is designed to interface with StoneFlecks multicolor finish during the curing cycle, and its moisture scavenging agents allow for fast top coating over waterborne coatings like StoneFlecks and Multispec® multicolor finishes. Mix 2:1 with GlasTech Lo 9000 Catalyst. 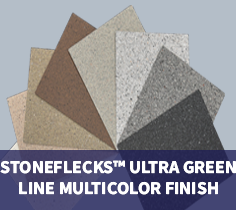 StoneFlecks Ultra multicolor finish provides a natural stone look to any surface and is available in a wide variety of colors. The proprietary Ultra formula lays virtually flat, eliminating the need to sand down texture before topcoating. This single component multicolor coating sprays easily with most HVLP equipment and can be top coated in as little as 30 minutes. Contact Hawk for information on the StoneFlecks Ultra multicolor point-of-sale display case which can be used to demonstrate StoneFlecks color samples and color combinations.